Surrender all actions and even the fruits of these actions to the Supreme. This is the essence of the Bhagavad Gita. 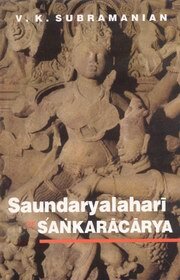 Saundaryalahari is a rare Tantric work whose authorship is attributed to Samkaracarya. It is a long poem of one hundred verses; a hymn of praise to the Divine Mother; an invocation and a prayer that awakens man from stupor to a state of effulgent energy and creativity. In this monograph the original Sanskrit text of each verse is presented in Devanagari script accompanied with its Roman transliteration. English rendering of the verses and explanatory notes are provided with an eye to modern readership. Inclusion of yantras in their pictorical symbols focus attention on underlying potencies of each verse. The possibility of attainment of power and success by single-minded recitation of the verses is stressed on. The monograph will be of special interest to mother worshippers of all denominations. Students of religion and philosophy will find it appealing. The general reader with a love for poetry and literature will also like it. V.K. Subramanian is an eminent Sanskrit scholar, who has translated several ancient Indian, Sanskrit texts into English. He has a universalistic taste and a is a prolific writer on a variety to subjects ranging from astrology to art. His published works include: Sivanandalahari, Maxims of Chanakya, Rudraprasna, Planets, Palms and Predictions, Lali and Other Short Stories.